This disclaimer applies to the website at http://www.gtscruises.co.uk and its linked cruise information pages (the “Website”) operated by Grahams Travel and their site operators. No warranties and/or representations of any kind, express or implied, are given as to the compliance of the information shown on the Website. Cruising information on this Website is posted in good faith and is updated regularly, but we cannot guarantee the completeness and accuracy of the information shown. Grahams Travel and their site operators are not liable for any direct or indirect loss arising from the information on this Website or the unavailability of any particular price, cruise or facility. The information is based on research using cruise company brochures and websites, other material, reference books, newspaper articles and personal experience. It is not independently verified. We recommend that you check information before you act on it, particularly since prices change, cruises or cabin types can be fully booked and timings and itineraries amended. Accessing the Website means that you agree that Grahams Travel and their site operators will not be liable for any direct or indirect loss arising from the use of the information or enquiry form on this Website. The following policy explains how we use any information we receive from Website visitors and how we protect your privacy. 1 When you complete a cruise enquiry form you are agreeing that you have a legitimate interest in the cruise you have enquired about. Therefore, we need to know your name, address, email address and telephone number to process your enquiry. This information, together with details of the cruise you enquired about, is forwarded to Grahams Travel to process your request for information. Grahams Travel will respond direct to you by telephone or email. 2 If you intend to make a booking as a result of the enquiry and any further information received, we would advise you to check the financial protection that Grahams Travel offer. 3 We use tracking software to monitor Website traffic and usage and to help us develop the functionality of the Website. This software does not enable us to capture any personal information. 4 Grahams Travel or their site operators will not disclose information about a Website visitor or enquirer to any other person or organisation without your consent unless they are legally required to do so or if there is an emergency situation that makes it necessary to do so. 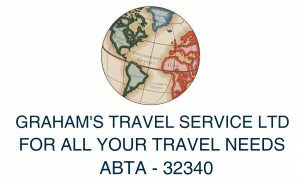 5 Grahams Travel or their Agents may send you occasional updates about Grahams Travel products and services via email, but they must get your consent to do so beforehand. You can unsubscribe from their mailing list at any time. This site uses some unobtrusive but essential cookies to store information on your computer. The site will not work properly without them. They are set when you first enter the site and when you enter your details on a form so the site remembers your details if you want to make further enquiries. These details are retained only for the duration of your visit to the site. We also use some cookies to anonymously track visitors to help us develop the functionality of the website. These do not enable us to capture any personal information. By using this site and submitting your details you agree to our Privacy and Cookie policies and the collection and use of this information by Grahams Travel and their site operators in the ways described above. Grahams Travel’s full Cookie and Privacy Policies can be found at www.gtscruises.co.uk.